The geothermal well drilling rig was essentially a mobile drilling platform (a big truck with a drill attached). 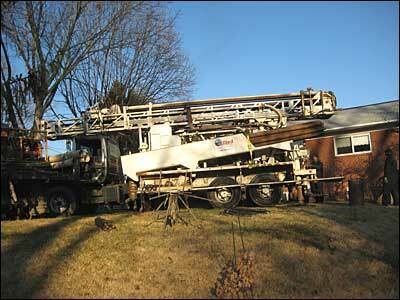 This allowed the company to drive to our single family home, part the truck in our front yard, and start drilling. Since we have a typical suburban yard we had to have the geothermal wells dug straight down (called vertical loops). We needed two 300 foot deep wells for our three-bedroom home. People with larger yards can have a long trench dug for the geothermal ground loop (called a horizontal loop) and avoid drilling. Either way works fine but the vertical loop is necessary when space is an issue. Either way it's all buried once the loops are connected. You can't tell the difference after the geothermal well drilling is done and the grass grows back. 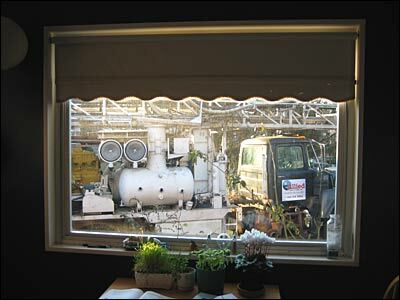 To give you an idea of what the truck used to drill geothermal wells looks like, here is a picture of what we saw out our front window while they were working. They haven't started drilling in this picture. The geothermal well drilling took about two days to complete. Once the wells were dug another guy came out with a backhoe and connected the ground loop tubing from the wells to our house.